How About This Clean 1991 Audi V8 Quattro Survivor for $19,499? The ad for today’s Nice Price or Crack Pipe Audi says it’s one of only 53 originals and that it could be one of the only ones left. That makes it a survivor, but will its price prove it to be the eye of the tiger? Chris Brown may have sung Don’t Judge Me, but that’s exactly what we did yesterday regarding the heavily-modded 2004 Lamborghini Gallardo that had been the rapper’s former ride. The changes to the car included hand-painted lettering all over, plus body and interior mods that really made it say Look At Me Now. Brown wasn’t too Loyal to the car apparently, and now it’s looking for a New Flame. Sadly, its F.A.M.E. couldn’t get many of you to Run It and so it went down in a massive 80% Crack Pipe loss. Sorry Chris, you done got a beat down. After that in-yo-face Lambo, I’m feeling like we need something that’s a little more sedate, more stock, and perhaps more stoically Germanic. I think we need a nice Audi - you know, as an automotive sorbet to cleanse the palate. Now, when it comes to Audis, your options are all over the map. For four-hundred grand you could by a Nürburgring-spanking R8 LMS GT3 that seats two and is one of only 45 promised to be built. Or, for a lot less you could go for this 1991 Audi V8 Quattro and bring 4 of your friends along for the ride. Who’d you pick to go? 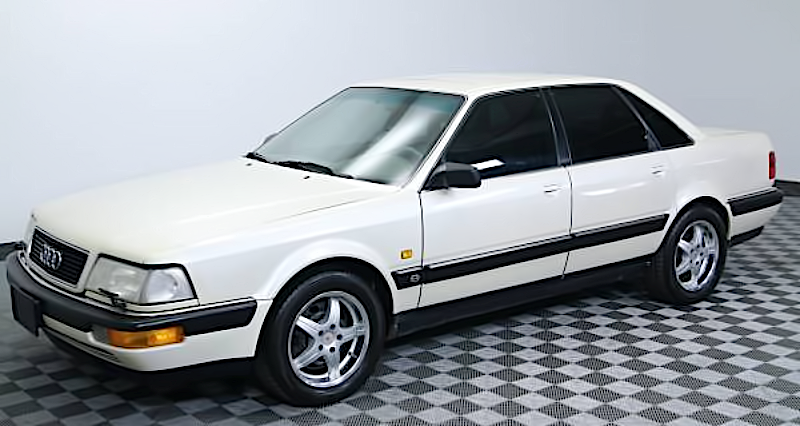 Whomever you choose, you’re all going to be riding in an Audi that’s almost as recherché as that racer, as the ad makes the claim that this pearl over grey V8 Quattro is one of only 53 cars imported to the United States with the five-speed manual transmission. That sought-after stick sits between the 247-bhp made by the DOHC 32-valve 3.6-litre V8, and Audi’s Quattro AWD system. That drivetrain is plum-full of Torsen diffs - one in the middle and one in the rear and is rumored to be good in snow. Befitting its place atop Audi’s food chain, the V8 Quattro was also outfitted with every last safety and convenience feature Audi could throw at it. That included an automatic climate control borrowed from Cadillac - no expense was spared! This generation of Audi is becoming ever rarer on the road as they are fairly expensive to maintain, parts are getting harder to find, and to be honest, there are a TON of alternatives in this class from which to choose. That’s why, should you have a massive metaphorical hard-on for the four rings, you’ll want to get the best example you can find. This one looks to be one of the best. The bodywork appears clean and without major flaw, while the interior looks as though no one has really lived in there at all. Oh sure, there’s a weird steering wheel cover that makes it look like an octopus has been driving it, but how much trouble would it be to yank that off? You might want to do the same with the window tint while you’re at it. Mileage is a nominal 182,000, which again supports how remarkable the car’s condition appears. What’s the other shoe drop on this car? Well, first off, the ad goes to great length expounding the technical aspects of the model - 3.7-inches of ground clearance! - but it doesn’t afford the same level of detail for the description of this specific car’s condition. That’s not how this works. That’s not how any of this works. The other possible issue might be the price as the seller is asking a not insubstantial $19,499 for the right to get your V8 on. The facts are that this is an apparently really great example of a rare and - for a lot of enthusiasts very desirable - ride. The problem perhaps is - as I noted above - there are plenty of alternatives for this kind of cash. What do you think, should a true Audi aficionado spend that kind of green on this pearl of a car? Or, is this V8 priced to make it more of a V-Hate? H/T to dieseldub for the hookup!